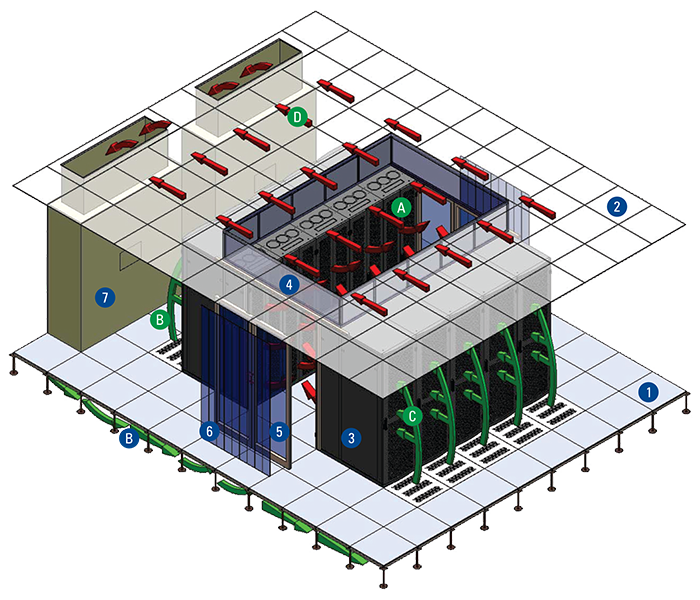 The HAC concept is achieved by enclosing both ends of the Hot aisle and are closed using Swing / Sliding Doors or Blinds for cold air containment and the Hot air returns to PAC through remaining area as shown in the Concept Drawing. In this concept Top panel is Perpendicular to Floor & Installed on the rack Top panel Vertically touches false ceiling, Top panel is composite metal toughened glass / Poly carbonate for Lighting can be customized. On Cold Aisle side the cabinets are fitted with Plinth, Rack Side Thermal Sealing and Blanking Panels between the equipment, in this way the only route for the Cold air is through the equipment.